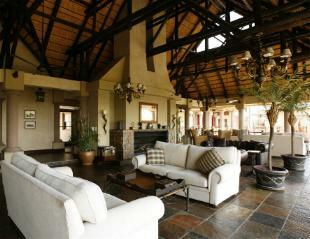 Royal Impala Lodge (Presidential Suite) is situated on the 21,000 ha Epacha Private Game Reserve. The Royal Impala Lodge forms part of the Epacha Game Lodge & Spa, this private villa is fully butler serviced and consists of 4 VIP Rooms and a Family unit. 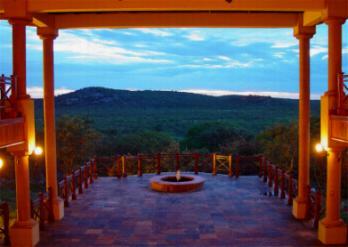 The Royal Impala Lodge is the ideal options for small parties and VIP dignitaries who require privacy and exclusive butler service. Conveniently detached in relation to Epacha Game Lodge, this villa has its own swimming pool, barbeque and entertainment area secluded in a private garden, kitchen, lounge and dining area. 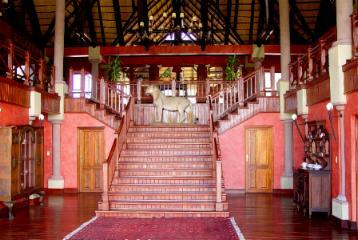 The VIP Room's configuration is the exact dimensions of Epacha Game Lodge. In keeping with the Victorian era in Africa, Royal Impala uniquely combines turn of the century elegance with personalised safari luxury - the chalets are individually appointed with specially commissioned antique furnishings and stylishly decorated in subtle, relaxing colours. All our luxurious chalets encompass a spacious suite and a magnificent en-suite bathroom, and each has its own private balcony, complete with a breathtaking view across the majestic private reserve and the Ondundonzondandana valley. All the rooms are equipped with air-conditioning, a mini bar, room safe, ceiling fan, telephone, coffee/tea service station and wireless internet connect ability. Guests can spend time relaxing in the privacy of the villa's exclusive amenities or indulge in any of the numerous lodge activities offered at Epacha and may utilise all the Epacha Game Lodge facilities. LOCATION: Epacha Private Game Reserve - District road 2695.